Following the tradition Chess-News sums up the year on one page and in pictures. 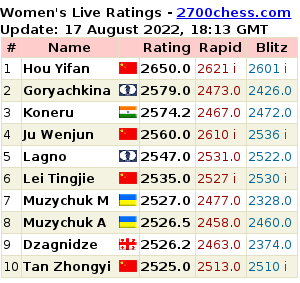 FIDE announced 2013 as the year of Elisaveta Bykova, but eventually it was more Magnus Carlsen's year. Carlsen after Wijk aan Zee competition: "I rarely feel like taking maximum of each game, but this is exactly that case." Ruslan Ponomariov celebrates Bptism in the icy water of Dnieper River. The conflict inside the Russian women's national team: Tatiana Kosintseva's letter and her sister, Nadezhda's interview were extremely popular. Gibraltar: Nikita Vitiugov won to leave Nigel Short without pounds. Marina Romanko twice winner of Moscow Open: "If I was still in the national team, I would refuse playing under Dokhoyan's supervision." Jurmala - "Latvian Wijk aan Zee." The Petrov Memorial was held here. Ivanchuk shows how he blundered and lost one of the games in the Petrov Memorial. Korchnoi arrived at the opening ceremony of the elit competition in Zurich. Ukrainian women won the world team championship in Astana and the European championship in Warsaw. Andrew Paulson organized the Candidates in London using SOCAR's sponsorship and didn't remind of himself by organising anything else afterwards. "PGMB Rostov" celebrates in the Black sea with -10 degrees water. The team qualified to the European Club Championship. David Shengelia, "My rival suspected me in cheating"
Sergey Karjakin won Stavanger competition and called it "the best in my career." Shakhriyar Mamedyarov claimed 2013 was his most successful year so far. Gelfand called Tal Memorial his best competition in years, "I only pity that Ididn't beat Carlsen." The Ukrainian championship was led by Ponomariov, but Kryvoruchko won. GM Andrei Devyatkin announced he quits playing chess," After 1.e4 c5 I already want to resign..."
Ernesto Inarkiev made happy his fans by winning the HIgher League and qualifying to the Tal Memorial. Topalov finished first in the Grand Prix Series and became the participant of the Candidates tournament. Hoang Thanh Trang became 14th champion of Europe. Suat Atalik, "FIDE is governed by mafia"
Tragically died GM Igor Kurnosov. Tomashevsky called his match game against Morozevich in the World Cup "the craziest in his life." Pawel Eljanov first one the Poikovsky tournament, then Chigorin Memorial. 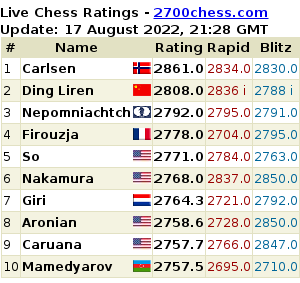 On the way to Anand, Carlsen won the competition in St. Louis. Aronian, "I played as an idiot..."
Hou Yifan regained the world champion title by beating Anna ushenina. European Club Cup took place at Rhodes which suffered from a waterspout. Read Georgios Makropoulos's exclusive interview for Chess-News: "Ilyumzhinov is the biggest guarantee at this moment in FIDE"
The friendly match Dubov - Shirov went without intrigue and finished int he experienced player's favor. Russia won the world championship: Dutch team beat Ukraine, but could do nothing against Russian opponents. RCF announced it will support Ilyumzhinov on the upcoming elections. Rex Sinquefield: "Next Year We Want to Do This Again Maybe a Little Bigger"
The winner of the Sinquefield Cup which is finishing in St. Louis is yet not known. Rex Sinquefiled, the American businessman and director of the event, announced "Next year we want to do this again maybe a little bigger," noting that this year's tournament exceeded his expectations. Following the tradition, Chess-News sums up the year on one page and in pictures. Most of the photos have been provided with links to the relevant reports - just click and refresh your memories of the important events happened in 2014. Last year's Tata Steel Chess tournament began from shocking news about the death of Vugar Gashimov, one of the top players of Azerbaijan and the world. Back then, a moment of silence was observed before the first round. David Shengelia: "Now You Can't Defeat a 2700+ Player Without Being Accused of Cheating"
One of the EICC participants David Shengelia, who represents Austria, joined us live on Chess-News radio today. It turned out something else than a lost game against Moiseenko on the first board made him upset, “This is a very important thing to mention. Today’s lost game didn’t upset me as much as my opponent’s – I don’t even know how to call it – silly, stupid commentary after the game. My rival said that he suspected me of using the computer during the game. Sebastian Feller's ban, imposed after his use of computer assistance during the 2010 Olympiad in Khanty-Mansiysk had been revealed, has now ended. Ukrainian chess player Kateryna Lagno has been granted Russian citizenship by Vladimir Putin, informs Itar-Tass. The statement has been published on the official portal today. "To comply with the request of Lateryna Lagno, born on December 27 1989 in Ukraine to obtain Russian citizenship," says the document. This is the time of the year when chess journalists are invited by the 64 magazine to vote for the Chess Oscar by casting a list of the ten best players of the preceeding year. Before I tell and explain my choice, which I have been doing publicly since several years, please allow me a general observation: 2016 is promising to be a great year for chess. We are expecting a Candidates tournament, a Chess Olympiad and a World Championship match (that shall be less one-sided than the last two). Nothing of the sort in 2015. Anatoly Karpov who has recently celebrated his 63rd birthday told Sobesednik the details of the meeting "which can't be found even in the entire international Internet." In 1979 Karpov met Salvador Dali in New York. From now on, 21-years-old WGM Nazí Paikidze will be the U.S. chess player.